View of St Barnabas's Church in Great Tey in Essex. This is one of the most impressive Norman parish church buildings in Essex. In the first half of the 12th century, the Lord of the Manor was Eustace, Earl of Boulogne, the son of King Stephen and Matilda, Countess of Boulogne. It is a typical Norman church with a cruciform plan and a crossing tower. As can be seen in this view, the crossing tower was built in four stages. 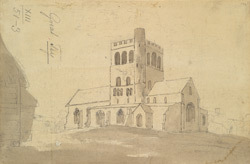 This shows the church before the dismantling of the nave in 1829.